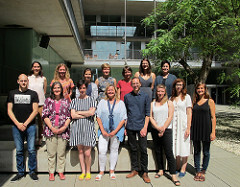 On June 26th, the HEIRRI Consortium gathered in Barcelona to celebrate the last meeting of the project, due to conclude at the end of August. The team used this opportunity to share final results of the several tasks of the project, but it was most of all a time for discussion and reflection about what the group has achieved during the three years of work. The meeting took place in the Biomedical Research Park of Barcelona, and was hosted by UPF, the project Coordinator. During the meeting, the HEIRRI members closed up different project tasks and together wondered about the future months. The team created with HEIRRI has been very successful in achieving the project goals but also in understanding the common goal of HEIRRI and advancing together for the overall excellence of the project.